Iowa volleyball continued downward slide in its loss against Maryland, dropping its fifth-straight. Sophomore Brie Orr (left) and freshman Hannah Clayton jump to block the ball during Iowa volleyball against Purdue at Carver-Hawkeye Arena in Iowa City on Saturday, Oct. 13, 2018. 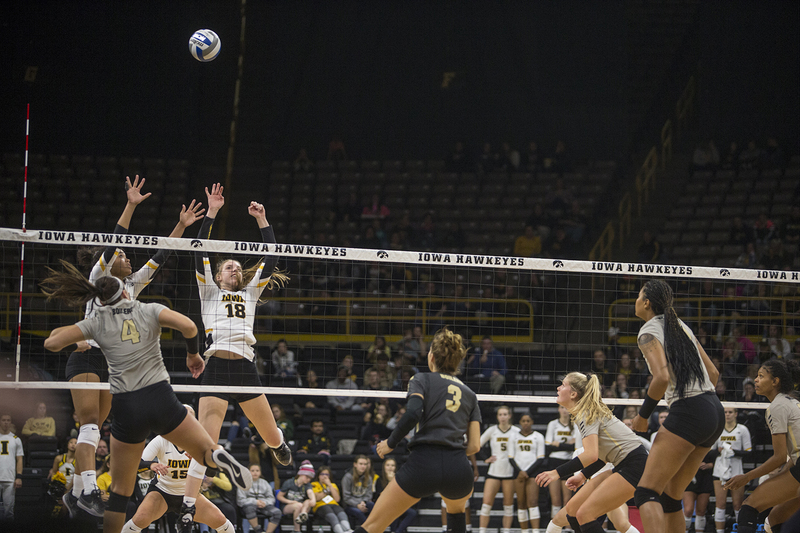 Iowa volleyball traveled for a match against Maryland, hoping to end its season-long losing streak of four matches. 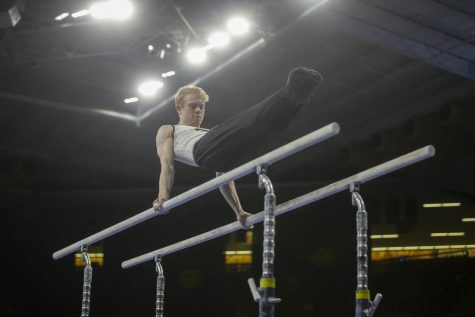 Instead, its struggles deepened as the Terrapins swept the Hawkeyes. 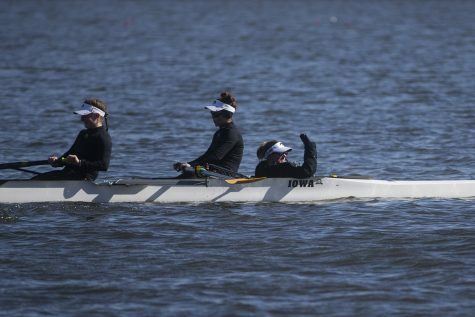 Hawkeye standout Cali Hoye was absent again in this match. The Terrapins soundly handled the Hawkeyes in the first set, 25-19. 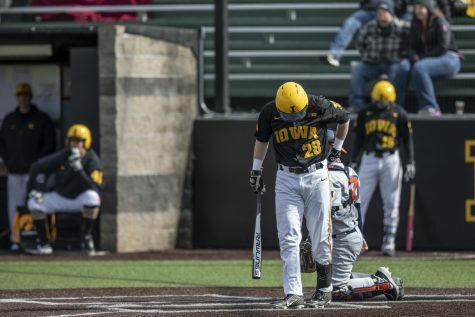 Iowa hitting was abysmal, at .067 percent. The Hawkeyes led for most of the second set, sparking some hope. 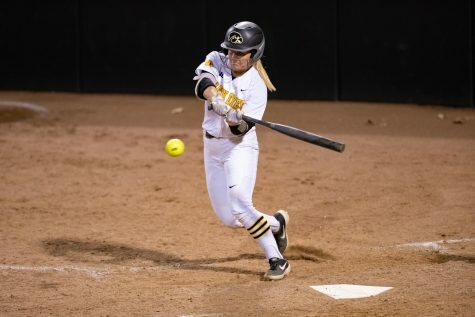 This was largely due to Reghan Coyle, one of the few Hawkeyes who generated some production. Coyle put up 12 kills on the night with only 5 errors, a solid showing. The Hawkeyes were able to leap out to a 15-9 lead in the second set through efforts from Coyle, Meghan Buzzerio, and Brie Orr. However, the Terrapins caught fire and roared back to a 25-22 win on kills from Erika Pritchard and Hawkeye mistakes. Iowa saw a momentum loss after losing the big lead to Maryland in the second set. A 5-point run in the middle of the third set gave the Terrapins the edge and eventually the win, 25-21. 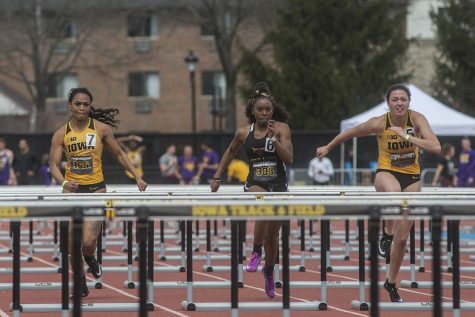 The Hawkeyes suffered a large blocking disparity against the Terrapins, 12-2. 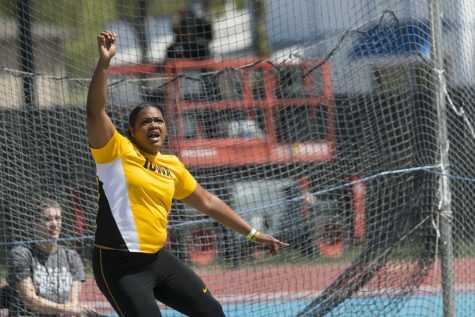 This was largely due to the efforts from Maryland freshman Rainelle Jones, who tallied 8. Iowa has not won the blocking battle in any of its last five matches. Also on Oct. 28, the large number of Hawkeye errors led to a meager hitting percentage of .090. 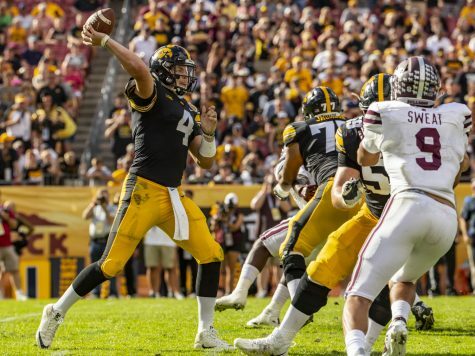 The lagging Hawkeyes were unable to contest the Terrapin offensive play. Iowa only put up 2 blocks as Maryland ran the table with a .214 hitting percentage. Pritchard had a big day for the Terrapins with 20 kills. The team’s struggles really began when Hoye missed her first matches against Wisconsin and Minnesota last week. These three matches all ended in three-set losses for Iowa. Her absence has affected the rest of her team, as well. Star hitter Taylor Louis has been very quiet in the last few matches, only putting up 5 kills in the loss to Maryland. Louis does not normally experience scoring droughts like this; the fire that Hoye brings to matches could be a cause of Louis’ struggles. The team seems to be hobbling to the season’s finish line. There was a lot of hope for the team after its upset of top-10 Wisconsin earlier this season, with thoughts of a postseason berth looming on the horizon. The five-match losing streak has all but quashed these hopes. 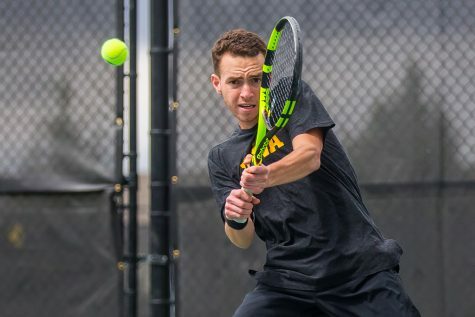 Some hope remains, however, as the squad has big-time matches coming up in the next few weeks; Purdue, Nebraska, and Penn State remain on the schedule, and if the Hawkeyes can muster up some wins, the season may yet be saved. 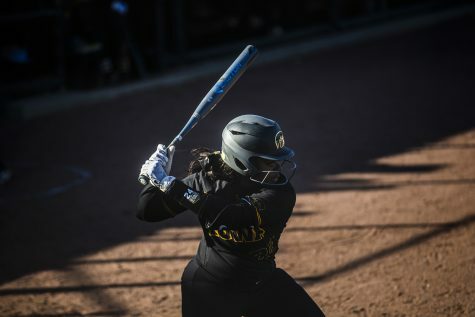 “Our team continues to battle and work hard, and coming up with victories on the road is always a challenge in the Big Ten,” head coach Bond Shymansky said in a release.